Health expenses account for 18 percent of the GDP in the U.S. which amounts to $3.2 trillion. Digitizing the healthcare industry can provide cost savings of $300 billion. Despite this, healthcare technology is not widely used because of the different parameters of healthcare law such as the Health Insurance Portability and Accountability Act (HIPAA) and the Health Information Technology and Clinical Health (HITECH) Act. With the field of HIPAA compliance in a state of constant flux, many healthcare players find it hard to keep up with regulatory compliance. Additionally, with the funding for Office for Civil Rights (OCR), the Health and Human Services division that enforces HIPAA regulations, being reduced, settlements will become more severe to bridge the gap. To counter these challenges in the healthcare compliance space, providers are on the lookout for newer technologies to enforce compliance. Avoiding errors with insurance and risk assessments, leveraging social media, obtaining business associate agreements, the inclusion of state laws, and vetting are seen to be some of the up and coming trends for providers. Additionally, to ensure compliance, providers need to actively look at the advancements in technologies such as blockchain, AI, mobility and cloud, and big data analytics. 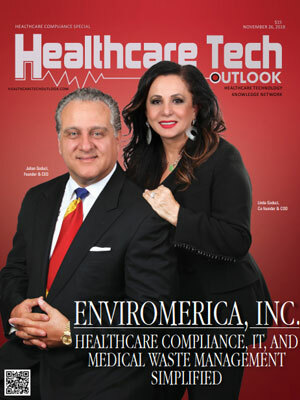 Considering these facts, a distinguished selection panel comprising CEOs, CIOs, VCs, and the Healthcare Tech Outlook’s editorial board has selected a list of the top Healthcare Compliance Solution Providers. These companies offer powerful solutions coupled with innovative strategies that are distinctively prominent in the field.